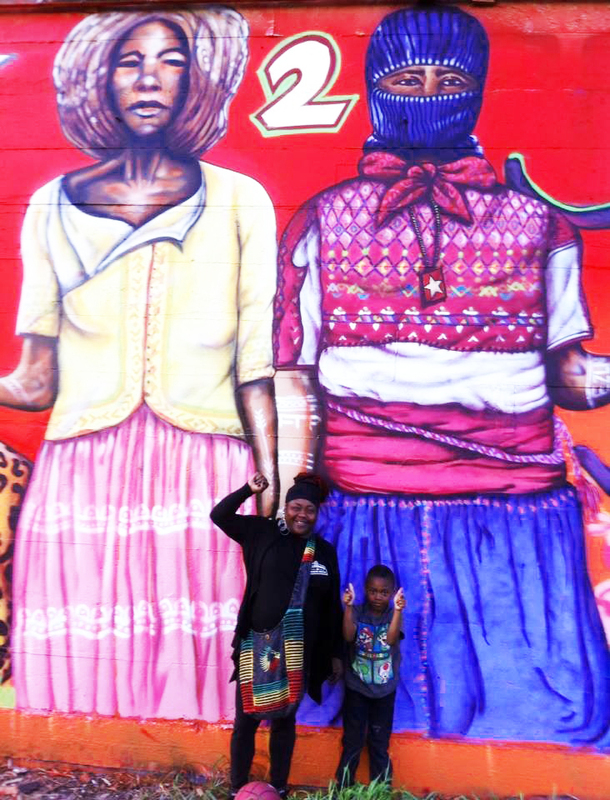 On Saturday, March 7, 2014, a group of people came together to paint a mural on the exterior wall of Qilombo, a radical social center located at San Pablo and West Grant in West Oakland. Over the next several days, the mural was completed by a variety of artists. During this time, people began to congregate in the garden every day. 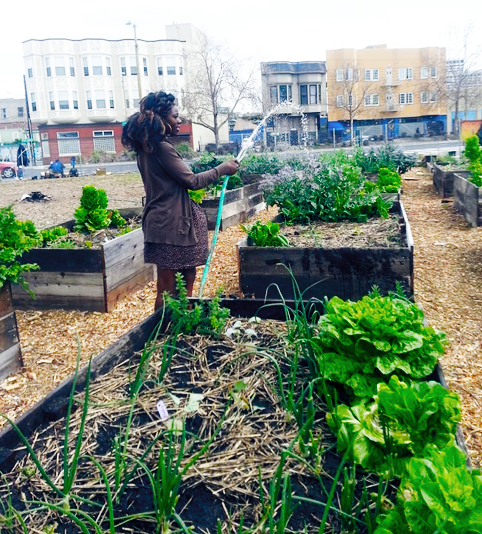 A dozen garden beds are now bursting with food and people are always there. This place is now called AfrikaTown, and Qilombo is at the center of it. A young woman waters the thirsty plants. All work at AfrikaTown is volunteered. On March 26, landscapers hired by the owner of the lot arrived with a bulldozer and began to open the fence around the AfrikaTown garden but were stopped before they could drive in. A group of people stood in front of the bulldozer and eventually the police arrived. Ultimately, the lot owner backed down and promised to return on Friday, April 3. Undercover law enforcement were seen observing AfrikaTown from unmarked cars, as well as two white males in a white van and a silver pick-up truck. The latter are probably contractors. AfrikaTown is within one of the “opportunity areas” of the West Oakland Specific Plan (WOSP). Because of this, the block that houses Qilombo and several low-income apartment buildings is now under increased threat of eviction. 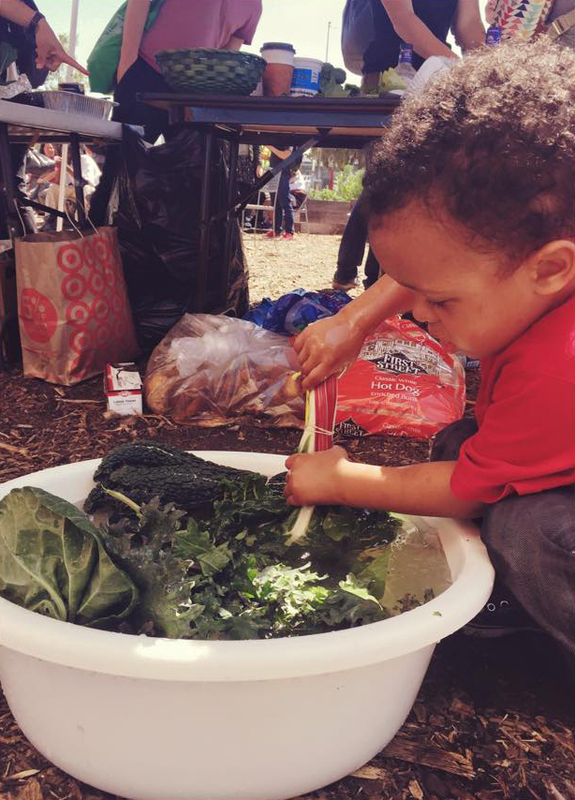 A little boy helps with food distribution by washing fresh kale from the garden. He’s learning that eating these lovingly produced vegetables will help him grow big and strong. Just six blocks from AfrikaTown is the old Sears building, now being called “Uptown Station,” which is slated to be filled with a luxury food court, BART access and tech offices. In between, a small park that had been the site of a long-standing homeless camp was recently fenced off. This fence was briefly torn down, like St. Andrews further north on San Pablo, but has now returned. The forces of capitalism are gathering around San Pablo – but so is the resistance. 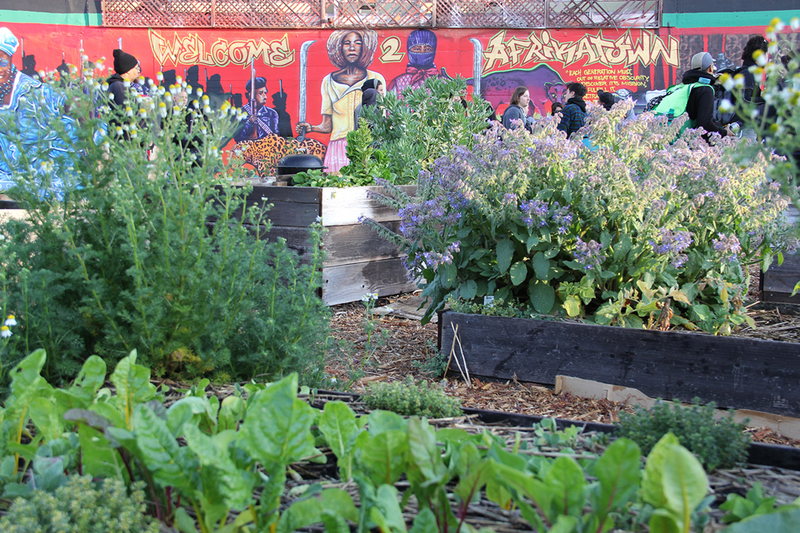 AfrikaTown is a militant example of land struggle, aimed at uplifting the Black population of West Oakland. The capitalists first tore apart West Oakland, and now they are trying to cleanse of it any undesirables. 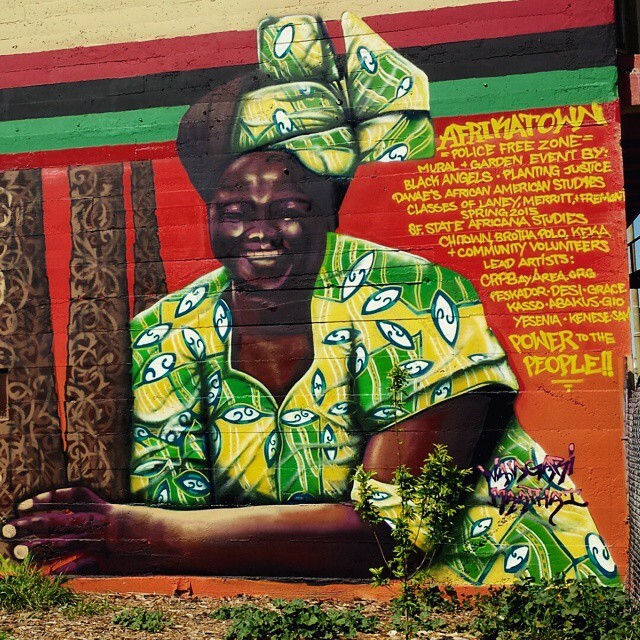 Efforts like AfrikaTown should spread to every neighborhood fighting gentrification. It is only by fighting that any of us will survive the attacks of the city and the police. Recently, we sat down with Linda Grant to talk about the struggle around AfrikaTown and how the surrounding community has been supporting it. FireWorks: What is AfrikaTown? Can you describe it for us? The mural, garden, the signs etc. Linda Grant: AfrikaTown is an autonomous zone for Afrikans to come and gather, share resources and organize the community against gentrification. We are also creating a counter-culture against capitalism and colonization. The mural over the garden represents unity and collectiveness of Afrikan culture and pays respects to the indigenous land that we occupy. We use the garden to teach the community about sustainable resources, healthy alternatives and empowerment from growing your own goods. The signs around AfrikaTown help Afrikans identify that we are Afrikan, not American. FireWorks: What was the inspiration for creating it? Linda Grant: We as Afrikans have lost a sense of self due to displacement in our communities, both presently and historically. AfrikaTown was created to combat gentrification and keep long-time residents of Oakland in their own communities. FireWorks: When did people start defending it? What happened that led to people holding the space? A closer look at one section of the mural – click to enlarge so you can read the message. Linda Grant: We have been defending AfrikaTown since about a year ago when we found out that the owner wanted to sell the lot after we put in all of the work to clean it and make it a useful space for the people in the area. We have been under constant threat by the realtor and the owner who previously failed to keep up the public maintenance of the lot. FireWorks: What is happening in the neighborhood in regards to gentrification and the police that will give people a bit of context for the defense of AfrikaTown? Linda Grant: There is a plan called the West Oakland Specific Plan that is in effect all across West Oakland that is being fueled by the city to spread gentrification more throughout our communities. We have been going to West Oakland neighborhood meetings and finding out more about the planning to displace Afrikan people throughout Oakland and letting people know that they need to fight back and defend their homes and spaces. The block-long mural, setting the theme and purpose of AfrikaTown, inspires the work of many hands to grow healthful food to feed the people. The police play a major role for gentrification because the new people moving into our neighborhoods are feeling uncomfortable with being around the people that they have pushed out. FireWorks: What has been the response from the neighborhood? What do people in the surrounding area think about AfrikaTown? Linda Grant: The response in the neighborhood around AfrikaTown has been amazing. The community members and business owners have come to us and told us that they support us 100 percent and they are glad that we are doing the best we can to change the community. FireWorks: What does the future hold for AfrikaTown? How can people support what is happening there? 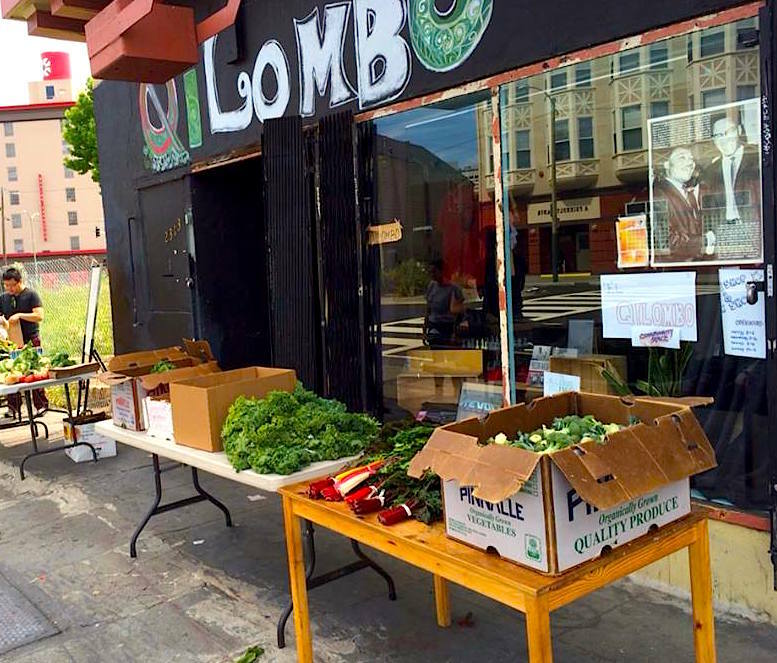 AfrikaTown produce is displayed outside Qilombo, available to the neighborhood. Linda Grant: The future for AfrikaTown is still very bright in spite of the constant repression that we are facing. We hope that the space inspires more AfrikaTowns, as it builds a sustainable community and takes ownership of OUR future for self-determination. People can help support AfrikaTown by coming through to Qilombo any day this week and plugging in. Also, food, resources and ideas are welcome. 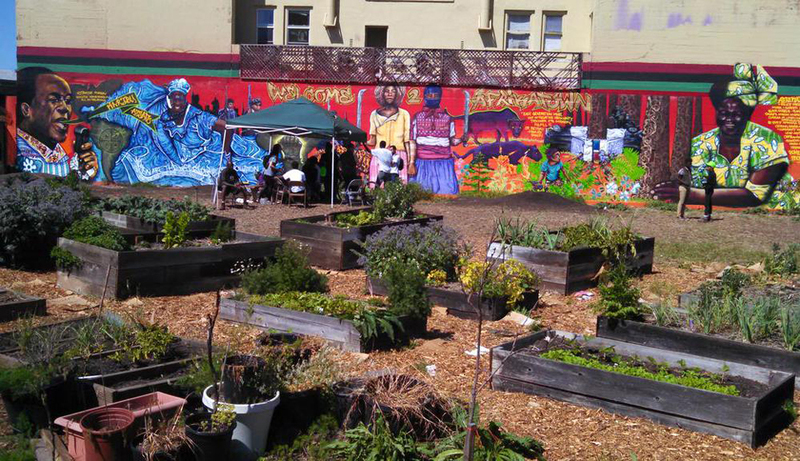 To contribute to the AfrikaTown garden becoming a permanent community resource for West Oakland residents, you can make a donation at http://www.gofundme.com/saveafrikatown. Contact the organizers at qilombo.org or via Twitter at @AfrikaTown. To learn more, visit Afrika Town Community Garden on Facebook, Qilombo and What’s Happening Black Oakland? This story first appeared on FireWorks: Anarchist Counterinformation Project for the Bay Area.